Summary : If you like blueberries, stop right now and go buy this tea at Culinary Teas, as this tea is a delight for anyone who likes blueberries! Review : I am not a huge fan of blueberries. So when I discovered this tea inside the box of tea I ordered, I was a bit disappointed. As such, when I first tried this tea I was sort of bracing for the worst. Yet, much to my surprise, I ended up liking this tea. Bingo Blueberry Herbal Tea is put out by Culinary Teas. Like all herbal teas, it has a very wide variety of leaves. 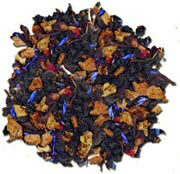 This tea includes blackberries, elderberries, black currants, apple pieces, hibiscus petals and cornflower petals. This wide variety of leaves in this tea also help explain the very pleasant flowery smell this tea has when first taken out of the bag. The smell, though, is neither strong nor overpowering. In short, the aroma is just plain nice. And like all teas from Culinary Teas, this tea came packaged in a vacumn sealed, lightproof bag - preserving both the aroma and the taste of the tea. Much to my surprise, I rather liked this tea. OK, it isn't my favorite tea. On the other hand, while the tea most definitely has a "fruity" taste to it - tasting remarkably similar to blueberries - the flavor is not overwhelmingly strong. Drinking this tea is certainly not like munching on a raw blueberry, for which I was thankful for. This tea also has a very pleasing, rather sweet, aftertaste to it as well. The other nice surprise about this tea was the very attractive, light purple color to it. This color, due to blueberry and elderberry leaves, really makes this tea very enjoyable to look at - and thus making it more pleasing to drink. Overall, this tea is not destined to become my favorite tea anytime soon - but I'm quite glad I accidentally ordred it. And anyone who really does love the taste of blueberries, or just happens to really like a "fruity tea", will really enjoy the taste of this tea. Recommendation : If you don't like blueberries, then avoid this tea. But if blueberries and you go hand in hand, then you will absolutely love it! Brewing Instructions : Use 1.5 to 2 tsp of leaves per cup (5.5 ounces) of water. Pour boiling water over the leaves and let brew for 5-7 minutes (6 minutes was used for this review). Bigelow Cinnamon Apple Herbal Tea : A uninspiring tea that has a poor "fruity cinnamon" taste.